Featured amenities include a computer station, express check-in, and express check-out. Planning an event in Lannion? This hotel has facilities measuring 387 square feet (36 square meters), including a meeting room. A roundtrip airport shuttle is provided for a surcharge (available 24 hours), and free self parking is available onsite. A stay at Cerise Lannion places you in the heart of Lannion, a 4-minute drive from Distillerie Warenghem and 9 minutes from Chapelle de Kerfons. This residence is 5.3 mi (8.6 km) from Chateau de Kergrist and 5.4 mi (8.7 km) from Chateau de Tonquedec. 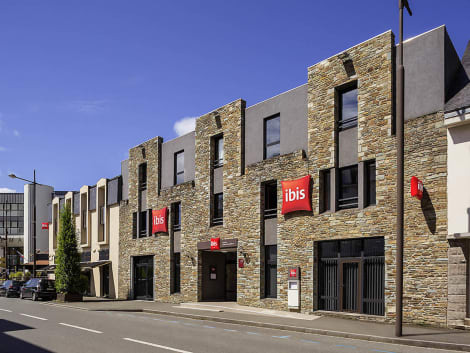 The Ibis Lannion Côte de Granit Rose is located close to the historic center of the town. 10 minutes from the beach and the coast, 55 yards (50 m) from the train station and 2.5 miles (4 km) from the airport. The hotel has 70 air-conditioned rooms with fr ee Wi-Fi, including three rooms for guests with reduced mobility. The hotel has meeting rooms, a bar with 24-hour snacks, a flower garden with terrace and a public paying car park nearby. Canoeing and kayaking, tennis and golf are also within easy reach. Enjoy a meal at the restaurant or snacks in the coffee shop/café. The hotel also offers room service (during limited hours). Mingle with other guests at the complimentary reception, held daily. Wrap up your day with a drink at the bar/lounge. Buffet breakfasts are available daily from 7:00 AM to 9:30 AM for a fee. lastminute.com has a fantastic range of hotels in Lannion, with everything from cheap hotels to luxurious five star accommodation available. We like to live up to our last minute name so remember you can book any one of our excellent Lannion hotels up until midnight and stay the same night.